K khukha Family Tree, a trial version has been launched. This Family Tree would provide our visitors a chance to see who their ancestors are. This Family Tree is at its early stages of completion, therefore, it is not complete or accurate by any means. The Family Tree document is an acrobat pdf format and visitors will need to have Acrobat reader version 7 or 8. This software is available free of charge from the following website. This Family Tree is launched just to test the ease of use or the degree of difficulty to explore and undersatnd the information presented. Just click on any of the two links below and it would open the file using Acrobat reader. Once the file is open just click on search button and input a name to start search. If it does not take you to your desired name, you might have to either click next or select your name from one of the names from the list. 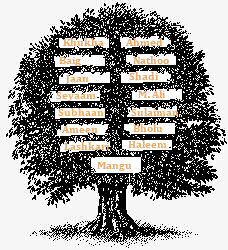 If your name is not on this Family Tree, please send us your FULL name, Father's and Grandfather's FULL name as soon as possible. Visitors can be assured that any information recieved regarding Family Tree will be updated on daily basis. Now Click on one of the following files of Family Tree and find out the details of your ancestors. Remember, Your feedback is very important to make this Family Tree more easily understandable, accurate and complete.